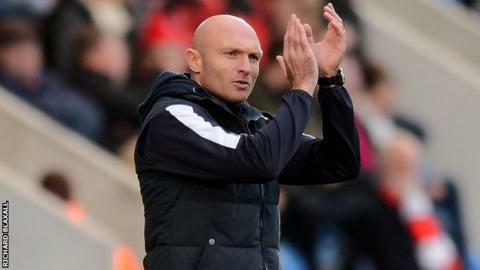 Caretaker boss Wayne Brown has withdrawn from the running to be League One Colchester United's next manager. The 38-year-old former U's and Ipswich defender has been in temporary charge following Tony Humes' departure by mutual consent in November. "I've had a long discussion with the chairman - I've decided the time is not right for me," he told BBC Essex. "I haven't slept that much - it's frustrating this massive opportunity has come at this moment." Brown won his first game in temporary charge against non-league Altrincham in the FA Cup, but lost the following week's league game against fellow strugglers Barnsley. The U's, who have the worst defensive record in the Football League having conceded 52 goals, are currently in the third-tier relegation zone, one point adrift of safety. "I'm sure there's people that think it's just managing a group of 30-odd players but there is so much more to it than that," he added. "It is best for all concerned - I know that I've made the right decision for myself and the football club. "At Rochdale on Saturday, I'll still be in charge and I'll be doing my utmost to prepare the lads in the best way I can to get a positive result." "What now for Colchester United? With an experienced number two alongside Wayne Brown, chairman Robbie Cowling probably thought he had all his ducks lined-up. "It's a brave and honest decision from Brown to admit he's not ready for the job and one he hopes doesn't come back to haunt him. "Fans will now be hoping the chairman looks outside with Kit Symons and Geraint Williams being linked with the vacancy. Both know the club well and have worked with young players."